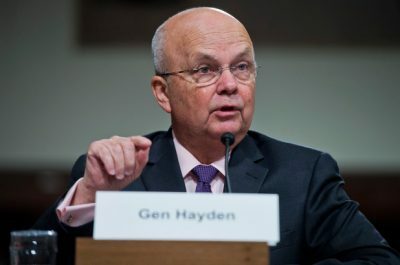 Very sad news – General Michael Hayden, former head of CIA and NSA, has been hospitalized after suffering a stroke. My heart aches for Jeanine and the Hayden family. Meanwhile, ‘liberal’ media outlets such as NBC, Associated Press, MSNBC, ABC, and CBS have all been offering boilerplate statements that ignore the man’s rather nefarious track-record as one of the most powerful people on the planet. The former four star airforce general served as director of the National Security Agency (NSA) under former presidents Bill Clinton, George Bush and then as director of the CIA under Bush and then president Barack Obama. As head of the CIA Hayden was totally unrepentant for the CIA torture programme which he inherited and continued, as well as the drone programme which has killed thousands of civilians. This would be the same programme that philosopher and activist Noam Chomsky aptly called “the most extreme terrorist campaign of modern times”. On top of which, analyst Peter Bergen testified before the US senate in 2013 that only two percent of people killed by drones in Pakistan were senior Al-Qaeda leaders. And only six percent of those killed in Yemen were identified as ‘senior militants’. In other words the vast majority of people killed were either civilians or everyday ‘foot soldiers’ who posed absolutely no threat to the US or its allies. “Research by Larry Lewis, formerly a principal research scientist at the Center for Naval Analyses, supports that conclusion. Lewis spent years studying U.S. operations in Afghanistan, including raids, airstrikes, and jackpots, all with an eye to understanding why civilian casualties happen and how to better prevent them”. In other words Lewis was working for the US government to assess the nature of the drone programmes that Hayden celebrates. “delivered by machines thought to be the most precise in the Pentagon’s arsenal… in Afghanistan were 10 times more likely to kill civilians than conventional aircraft”. Far from being “the most precise and effective application of firepower in the history of armed conflict”, what Hayden helped to oversee was the unleashing of a perpetual terror-generating machine. A terror-generating machine that has been part of a wider faux ‘war on terror’ that has destroyed the lives of perfectly innocent hundreds of thousands of men, women and children. As a matter of law Obama was obligated to initiated prosecutions against the Bush era war criminals, including those implicated in torture such as Haspel and Hayden. Instead, Obama involved the US in at least five more wars, expanded and institutionalised the National Security-Surveillance state, the drone wars and re-colonised the African continent with an ever expanding number of US military bases, soldiers, and special forces. It may not be appropriate to celebrate the stroke of Mr Hayden, but nor should he be celebrated by those of us who genuinely support liberty, democracy and the Rule of Law. The fact that Hayden is described as a ‘patriot’ and a ‘man of honour’ by the ‘liberal’ establishment exposes just how vacuous and shallow the ‘liberal’ establishment and their #hashtag resistance are. This includes the Democratic Party which has either endorsed, or failed to challenge, the worst policies of the Trump administration including its continuation of US imperial wars. Anyone under any illusions as to the nature of the Democratic Party should take a look at the work of journalist Patrick Martin at the World Socialist Website which revealed that the Democratic Party has been recruiting and backing a record number of ex-military and ex-CIA officials to its ranks. In fact, the latest ‘blue wave’ has seen no less than eleven veterans of the US military and the CIA. As journalist Patrick Martin explained to journalist Scott Horton these are merely the candidates who openly advertised their militarist backgrounds. There may be others who didn’t promote it as part of their candidacies. The point is, there are real heroes out there. Everyday men and women who challenge corruption, speak truth to power, and expose waste fraud and abuse. There is no reason to settle for a fake. Mohamed Elmaazi obtained his LLB from SOAS and Masters in International and Comparative law from the American University in Cairo. He worked in human rights law for a number of years before shifting to journalism. He occasionally reports for The Real News Network and currently writes for Open Democracy and The Canary.